I received a wonderful package of copper beads and do-dads from Auntie’s Beads a short while back. 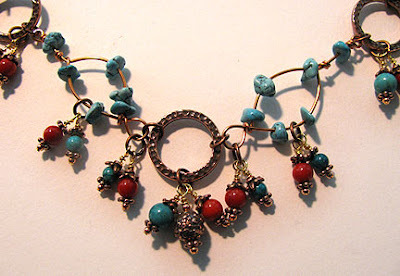 My mission was to see what they wanted to become :-) To make a necklace similar to this one, you'll need copper colored wire, some stone rounds and chips (I used turquoise and coral), and lots of cool copper stuff! 1. 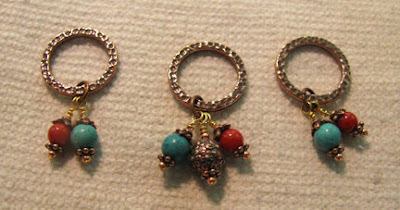 Create wrapped loop dangles with head pins, 2mm copper rounds, daisy spacers, stone beads, and bead caps. Attach them in clusters to the hammered round links. 2. Cut 5" pieces of wire and make a large wrapped loop at the 2" point. 3. Slide 3 chips onto the long wire and 2 onto the short one. Make a wrap with the short wire and clip off the end. Slide on one more chip. 4. Finish off the wire with a small wrapped loop. Make as many of these links as you desire. 5. 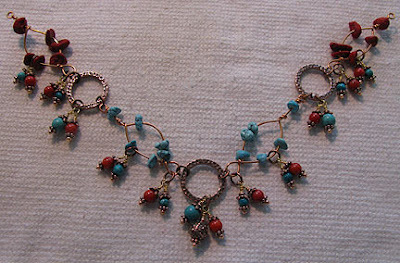 Add more dangle clusters to the large wrapped loops, and in between the 2 chips on the bottom of each link. 6. Hook the all together with jump rings. 7. 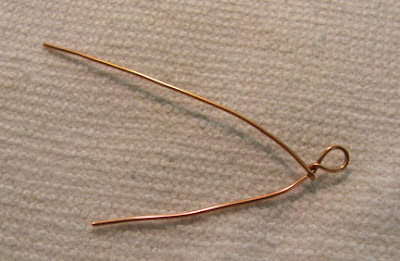 Use crimps to attach beading wire to the ends of the links. 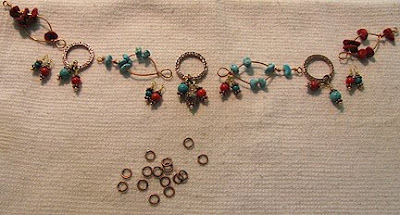 Add the number of beads that you need to achieve the length you desire, and crimp to some short segments of copper chain. Add a hook to the short end and a dangle to the long end of the chain. Muchas gracias por el tutorial. Es un collar precioso. Voya intentar hacerlo. Gracias de nuevo. Haces un trabajo excelente. hey this necklace is fantastic! thanks for explaining it so I could understand. I love this style...it reminds me of where I lived a long time ago in Pheonix (arizona)well anyways just wanted to say thanks . thanks so much for the complete photo tutorial! 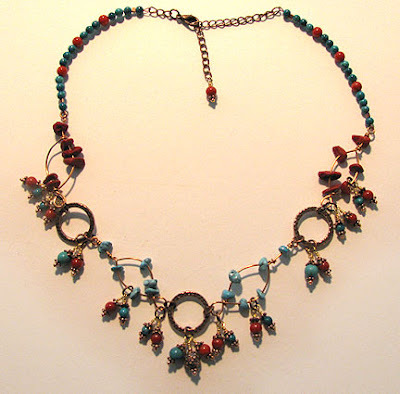 my sister gave me some turquoise and coral many many years ago, and i have an old hematite necklace that will look lovely with this pattern. this will also be my first wire necklace. thanks again, i can't wait to make it! Oh, I really wanna see what you make! !